The subject of bookstores in Seattle is an interesting one. A survey ranks Seattle as the country’s second-most literate big city as measured by the number of bookstores, library resources, newspaper circulation and education. Seattle loves books and bookstores. While preparing to write about Elliott Bay Book Company, I took a moment for an update on McCoy Books in Seattle; a fabulous bookstore I visited and then featured in a scene in my second novel, Facing East. My google search came up empty. It’s gone! As a nod to the small independent bookstores that know their books and customers, I am glad I included McCoy’s in the novel. 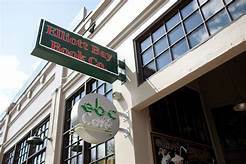 Elliott Bay Book Company in Seattle is located about a mile from Amazon’s headquarters. You know that a certain amount of tension exists between Amazon and the Elliott Bay Books of the world. But, the bookstore’s profits have increased partially due to Amazon’s employees and families. Even a bookstore will benefit from the thousands of tech workers Amazon has hired at its downtown headquarters. Amazon, like other large companies located in urban areas, help bolster the economy. It draws other investors into the area who are looking for a vibrant, interesting place to live. This energy creates investment and new businesses. The aphorism credited to John Kennedy….a rising tide will lift all boats – can happen. Let us celebrate a great, full-service bookstore, located in an architecturally interesting space. Elliott Bay Book Company is an important part of the Seattle book world. When people consider relocating, part of what they look for is a sense of place, fair taxes, good schools and healthcare, cultural assets. Bright, energetic, community-minded people always look for a bookstore like Elliott Bay. Here is a wonderful architectural setting, a wonderful city, Seattle, and wonderful booksellers who are good stewards of the book world…our passion. This entry was posted in Ato Z Blog Challenge 2018 and tagged AtoZ Blog Challenge 2018, Elliott Bay Book Company-Seattle WA, Facing East-A novel by Stepheny Houghtlin. Bookmark the permalink. Looks inviting. Seattle is the setting of my A to Z for the letter H this year. I’ll look forward to your post as I do each day. Your blog has always been one of THE best examples of how to do it right. I’m pleased you are taking the time to check on the bookstores I’ve selected for the #Challenge. Thank you. I understand Amazon has opened an actual walk-in bookshop to capitalise on the resurgence in interest of ‘proper’ books. I have to say though, Elliot Bay Books looks and sounds delightful. Delighted you could come with me to visit Seattle and Elliott Bay. The community is lucky to have such a great resource. Come back and visit more architecture, locations and great people who sell books. A garden tour took me to Seattle some years ago that was fantastic. The gardening world out there with their climate and competitive natures to make “my garden the best” has created a unique world of gardening. I haven’t seen Elliott Bay, but McCoy’s that I mentioned made a perfect setting for use in my novel, Facing East. I was sorry to find nothing about them now. Come back for another stop on the bookstore tour. This looks like a wonderful bookstore. I’m pleased to hear it is thriving and not negatively affected by Amazon. I live in a rural part of England where, unfortunately, there are few good bookstores to choose from. In my hometown, we only really have two chain stores-W H Smith and Waterstones. They are both okay but don’t have the charm of independent bookshops. Luckily, a couple of hours away from where I live is a beautiful historical town that has a number of hidden gems, including an old independent bookshop that sells many interesting limited editions. Sadly, they are too expensive for me to buy but I love to browse them anyway. I’m delighted you found my blog through the #Challenge. I would love to know the name and location of ‘your’ historic town bookshop. If you are like me, the pleasure of browsing is often enough. Hope you will have time to join me again for another stop on the bookstore tour. McCoys that I write about was a hole in the wall compared to Elliott Books, but Seattle does love their books. Because I was on a garden tour, the focus of the Seattle adventure, I missed others, and in doing this research for the #Challenge, regret it. I love my e-reader too although I turned down the offer to have one as a gift for several years before I gave in. I have loved it for many reasons; traveling which you mention, is so much easier than hauling heavy books. Shelf space became an issue when we sized down. My Kindle helps with that problem for sure. Nothing like a book-book, but I’m thankful for my Kindle world. That looks like an amazing bookstore. I’d love to be able to visit it! We had a small independent bookstore in our town. Alas, they closed about three years ago. I miss them. I use and enjoy my Kindle for many reasons and I had hoped that they would drive down the price of a novel ($27-29) I blame the cost of books more than Amazon, which I love. A great bookstore is a must and I hope a solution can be found to keep them open while competing with attractive savings. I think I might base some travel decisions on your theme this year. Amazing! Wish I could go with you since you may visit one of the bookstores I have written about. Would love to know which ones have made your list. All the ones stateside. I doubt I will have a chance to go overseas. This looks like my kind of store where I could lose myself browsing for hours, and leave with far too many books every time. Wish we could both visit and we could help each other carry our books out the door. What a wonderful theme for the A to Z Challenge! 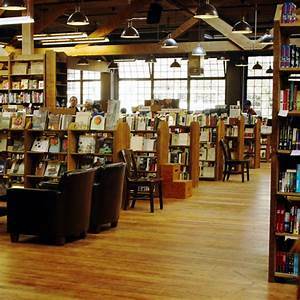 My husband and I love to visit bookstores, and will be visiting my sister near Seattle later this summer. We’ll have to put the Elliot Bay Bookstore Company on our list of places to visit! If you are a gardening person, Seattle is a great destination. When you walk through the door this summer at Elliot Bay, I’ll be with you in spirit.